William Howard, Lord Andover and thence by descent in the family. This work has been dated to circa 1750, soon after the artist's return from Italy in 1749, by comparison with two drawings in the Yale Center for British Art (A. Wilton, The Art of Alexander and John Robert Cozens, New Haven, 1980, p. 24, nos. 7 and 8, illustrated pl. 4), though see also Cattle in a Landscape, dated by Wilton to the 1770s (op. cit., p. 27, no. 17, illustrated pl. 7); these compositions reflect the Claudian classical compositions that Cozens would have associated with Italy. 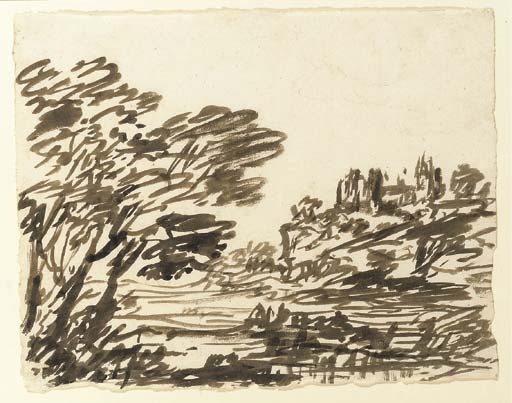 The approach and technique of these drawings is distinct from the 'blots' published in the artist's A New Method of associating the Invention in Drawing Original Compositions of Landscape, published circa 1785 (see Wilton, op. cit., pp. 31-5, nos. 26-68, illustrated pls. 13-20). The collection of William Howard consisted of many drawings by Cozens; some of which were dated between 1743 and 1778.